Product prices and availability are accurate as of 2019-04-16 18:13:08 UTC and are subject to change. Any price and availability information displayed on http://www.amazon.com/ at the time of purchase will apply to the purchase of this product. A mid-century darling, the IMAX Largent Floor Lamp boasts a metallic drum shade and tripod spindle base. 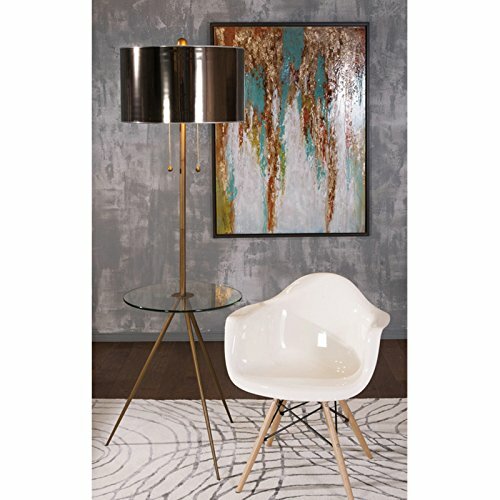 A gleaming glass table makes this mid-mod floor lamp as smart as it is stylish. It requires one 25-watt bulb, not included. What began as a small company importing copper flower containers in 1984 by Al and Faye Bulak has developed into one of the top U.S. import companies serving the At Home market today. IMAX now provides home and garden accessories imported from twelve countries around the world, housed in a 500,000 square foot distribution center. Additional sourcing, product development and showroom facilities in the USA, India and China make IMAX a true global source. They're dedicated to providing products designed to meet your needs. This is achieved through a design and product development team that pushes creativity, taste and fashion trends - layering styles, periods, textures, and regions of the world - to create a visually delightful and meaningful environment. At IMAX, they believe style, integrity, and great design can make living easier. Dimensions: 20 diam. x 68H in.. Shade dimensions: 20 diam. x 20H in.. Neutral tripod base with glass table. Metallic drum shade. Pull chain switch. Requires one 25-watt Edison bulb (not included).